Voting is not required in the U. S., as it is in some other countries. The former Soviet Union used to brag about its 98 percent voter turnout on Election Day — but citizens faced stiff fines and punishment if they didn’t exercise their right to vote for the candidate their government told them to vote for. But, in truth, there are so many compelling reasons to vote in our country, it’s a wonder the voting turnout here doesn’t come close to approaching that of the countries that demand it. The vote of a person who has contributed $1 million to a candidate counts for no more than the vote of the person who has given nothing to a campaign. After all, winning elections is all about getting a majority of the votes cast. Secret ballots like the one in the U.S., do not permit unequal weight to be attached to a certain person’s vote. Votes are one-size-fits-all. Politicians need the votes of the “little people,” and there are more “little people” than there are rich and powerful ones. Figure 1 illustrates just how few people who are eligible to vote actually do. The outer circle represents the number of people in the U. S. who are eligible to vote. 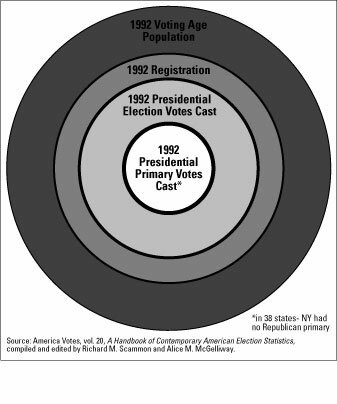 The next circle in the figure is the number of people who registered to vote in the 1992 elections. The next circle represents the number of people who actually voted in the 1992 presidential election. The number of people who actually voted is the 1992 voting population. The smallest circle is the group of people who voted in the primaries. Think how different things might be if everybody who could vote actually voted. Figure 1: What would election outcomes be if every eligible citizen voted?